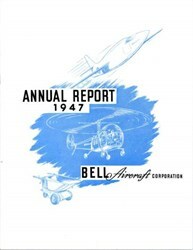 Bell Aircraft Corporation annual report issued in 1947. This historic document has 16 pages and images of an airplane ( XS-1 ), helicopter and Prime Mover on the cover and is over 57 years old. This report includes lots of pictures and financial information.